The other day I was telling my friend that my dog, Chet, believes his step-sister, Mali is the spawn of Satan. After witnessing her behavior tonight, I think Chet may be right. We were all cuddled up on the couch together. Sometimes the two of them want to be in the same spot. Chet has seniority though and he was sitting closest to me. Mali had made several attempts to usurp his position but she had been foiled by me, mostly because her idea of being closer is sitting on my head. Suddenly Mali's eyes began to glow red. She pounced on Chet who yelped, it was not so much a yelp of pain as it was of fear. Mali only knew she had elicited a reaction and she was thrilled. She pounced again in a move the WWF would be proud of- and they both tumbled to the floor. Chet scrambled and rolled himself upright. Mali met his moves and sat on her haunches, one paw on either side of his head, batting him with a succession of right and left punches. Suddenly, she had gone from WWF theatrics to a boxing match. Chet's head went back and forth, snapping at her paws... he looked like windshield wipers gone mad. Mali ran away from him with Matrix like agility, she banked off of walls- ran over the couch- slid across the glass topped end table- her eyes fixed on mine because she knows being on tables is a no-no, landed on the bare floor where she tried in vain to get traction and collided with the spider plant. Chet seized the opportunity to jump on her and give her what for-she feigned submissiveness by rolling over on her back. Chet walked away, thinking he had properly schooled her, when to his dismay she jumped up and over the back of the couch and right into my lap- occupying the spot he had been and she wanted when this all started. Chet looked at me with eyes that said "Mom, how could you??" All I could do was laugh. 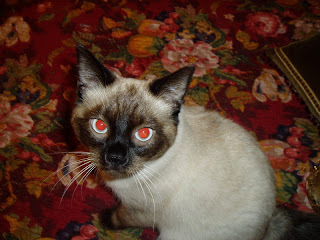 I am so thankful that God gives us pets... even kitties whose eyes glow red in the dark!